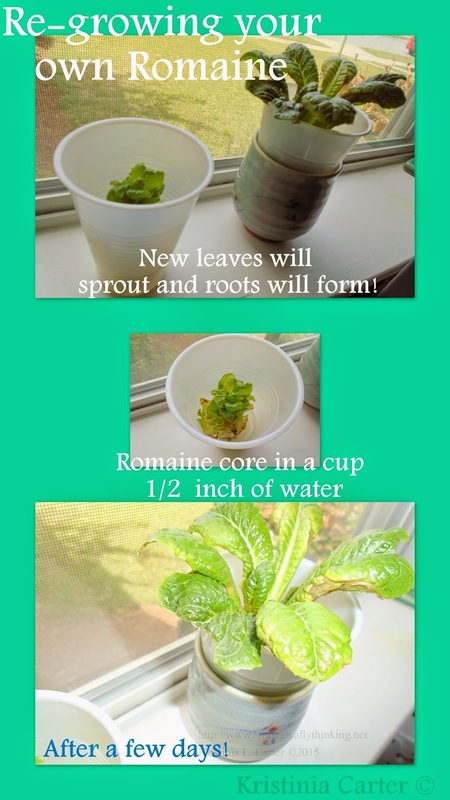 is the stub of a romaine stalk, a plastic cup or little pot, about a 1/2 inch of water, and a window-sill to start! Cut the core from your lettuce head, about 2 inches from the bottom. Place in a cup, pot, glass bowl, anything that the stalk will easily stand straight in. You can use toothpicks at the bottom to help keep your stalk steady, I didn't need to do that though. Add water about 1/2 inch. I would pour out the water daily and refresh with new water, be sure to spritz the leaves too, check the growth of the romaine leaves to make sure none are drying out, if any are dried out remove, the rest will still grow! After about 7 days you can place your romaine with the leaves above the soil in a planter box outside or in your garden or wherever you may choose to grow your Romaine! It takes a few weeks to grow a full head of Romaine. Remember to keep watering your Romaine at least the first week, hydration is vital so your leaves don't dry out! You can simply grow your own romaine for your salad all by saving those stubs! Great project to get the kids involved with. They will get a kick out of watching it grow daily. My daughter is excited to try our Romaine with ham and ranch dressing. We make romaine lettuce wraps for lunch and school lunches. The tasty little wraps also make a great snack and appetizer!